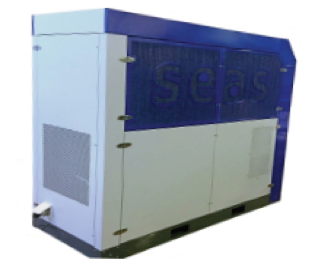 The AWA MODULA 100 system produces up to 1000 litres per day of very high quality water. The utilisation of the HVAC (cool air, hot water) energy produced during water production can provide substantial energy cost savings which can totally offsets the cost of water production. The AWA MODULA 100 system can be easily installed in private homes, hotels, resorts, residential buildings, hospitals, farms, camps, communities, greenhouses, hydroponics and irrigation. Available cooling thermal power (Air) 4600 m3 / hour at 24°C and 40% R.H.